In general relativity, gravity is represented not as a force, but as a curvature of spacetime. This was first verified in 1919 when Arthur Eddington observed the deflection of starlight during a solar eclipse. Since then we’ve observed lots of examples of such gravitational lensing. Often these occur when a distant quasar is obscured by a closer galaxy, though the effect is also seen when measuring the positions of stars. Usually, the gravitational lensing we see by galaxies are largely static, since the background quasar or galaxy is a fairly uniform light source, but a new paper in Science presents the observation of a distant supernova gravitationally lensed by a closer galaxy. This has produced multiple images of the explosion not only at different points in space, but also at different points in time. Multiple appearances of the supernova. 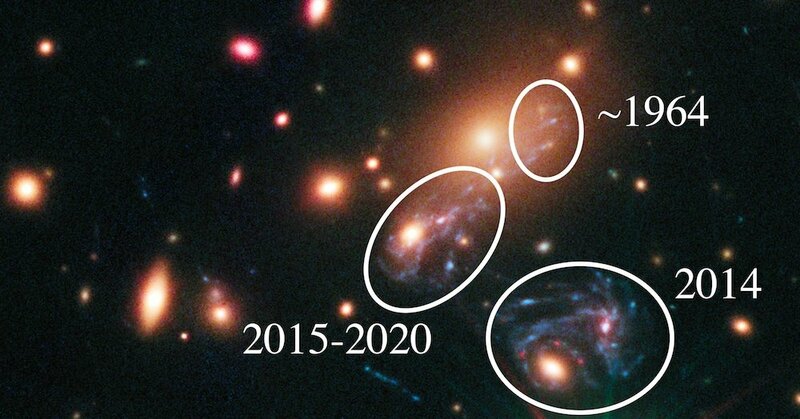 The team happened to observe a supernova that occurred about 9 billion years ago. Since it happened to be located almost exactly behind a closer galaxy, it was seen in multiple locations due to the gravitational effect of the galaxy. The gravitational lensing also made the supernova appear brighter than it would on its own, since gravitational lensing can magnify an image similar to the way a telescope can. We’ve seen this kind of thing before, but the difference is that a supernova brightens quickly and then fades, unlike a distant galaxy or quasar. This meant the light reaching us was only visible for a short period of time. But since light traveling around one side of the foreground galaxy travelled a different distance than light taking a different path around the galaxy, the flash of the supernova appeared not only at different locations, but at different times. 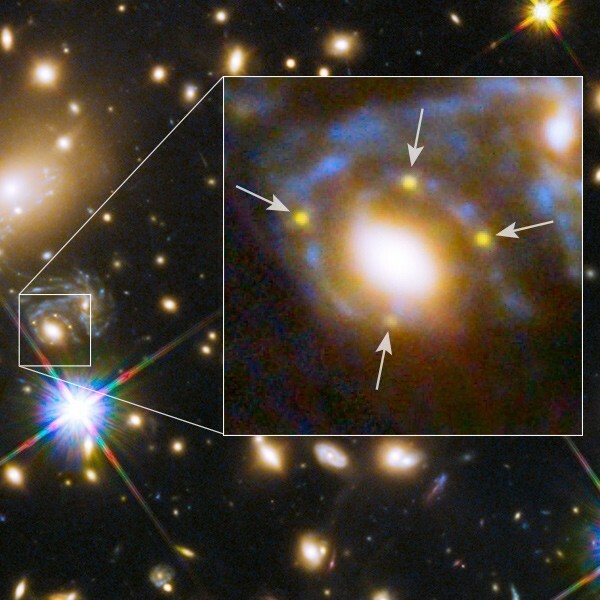 The team saw four different images of the supernova over the course of a few weeks. Having observed this, the team figured that other images of the supernova should have appeared at different times before. Looking through past observations of the galaxy, they found other appearances of the supernova in 1964 and 1995. They also estimated that another appearance should occur in a few years. Because of the great cosmic distances, different paths of the supernova’s light can vary in their travel times by decades, so we can observe this single stellar explosion again and again as the light reaches us along different paths. We’ve known this kind of thing should happen in theory, but it’s really neat to actually observe the effect. As we see more appearances of the supernova, it will give us detailed information about the distribution of matter around the galaxy. Combining information about the amount of lensing with the light travel time, we can make a map of the shape of spacetime near the galaxy, and that will tell us about the distribution of both regular and dark matter in the region. It’s astonishing. Almost unbelievable. Makes me wish there was such a thing as a dedicated cluster watching telescope with the sole purpose of imaging as many of these as possible. There are enough galaxies in the clusters and enough star formation going on in the background galaxies that it’s just got to be an amazing sight to see the supernovas light up the fields year after year. Amir, Neutrinos behave almost the same as photons in curved space. They’ve got a very tiny bit of rest mass, so the bending is slightly stronger and their pathes differ a tiny bit from the photons’ pathes. And as neutrinos don’t really interact with the matter between the supernova and the galaxy and ourselves, they’ve a much bigger chance to reach us than photons.